Just as software manufacturers provide updates for your main computer, Apple occasionally updates the iPad system software to fix problems or offer enhanced features. If you’re not using the iCloud feature, which updates your iOS automatically, occasionally check for an updated version (say, every month). You can do this by opening Settings, tapping General, and then tapping Software Update. 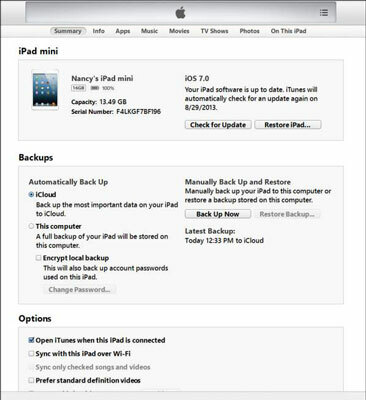 Note that if you’ve chosen to back up and restore iPad via iCloud when you first set up the device or later using Settings, restoring and updating your device happens automatically. Click your iPad’s name near the top-right corner of the screen. Click the Summary tab, as shown in the figure. iTunes displays a message telling you whether a new update is available. Click the Update button to install the newest version if yours isn’t up-to-date. Get system updates for iPad through your iTunes account. If you’re having problems with your iPad, you can use the Update feature to try to restore the current version of the software. Follow the preceding set of steps, and then click the Restore button instead of the Update button in Step 6. Typically, restoring an OS to another version does run the risk of going back to original settings, so be aware of that going in.